The north east region of India is one of the most compelling parts of India. 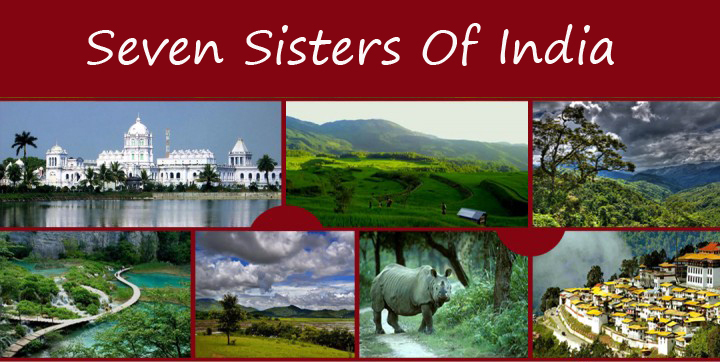 The Seven Sisters of India are also known as Paradise Unexplored and refers to the states of Arunachal Pradesh, Assam, Meghalaya, Manipur, Mizoram, Nagaland and Tripura. These states are famous for diverse culture, amazing flora and fauna. Arunachal Pradesh is the orchids. Tawang in Arunachal Pradesh is the birthplace of the sixth Dalai Lama, Tsangyang Gyatso which was known for his love of women, wine and poetry. The state has various tourist cities with different vegetation and ethnicity. The state is also famous for Trekking and Rafting. Assam is famous for the world’s oldest operating refinery, DigBoi. The state is blessed with variety of flora and fauna. Manas Wildlife Sanctuary and Kaziranga National Park are most famous parks of Assam. Some famous adventure sports of the state are rafting, parasailing, motorcycling and camping. Assam is most famous for its tea gardens. Manipur is also called as Switzerland of East of India. The state is the home to the Keibul Lamjao National Park, the only floating park in the world. The state is rich in flora and fauna. Popular sports of Manipur are Boat race and Manipuri Hockey. Meghalaya is the state that receives maximum amount of rainfall. The place Mawsynram in Meghalaya is the wettest place in the world. The state is also known for living root bridges. The main communities of Meghalaya are Khasis, Garos and Jaintias with different cultures and customs. Mizoram is the major tourist attraction point for its beautiful landscapes and pleasant climate. The two most beautiful hill stations of Mizoram are Reiek Tlang and Hmuifang. The state is also the leading producer of Bamboo in India. Nagaland is the land of festivals like hornbill, Miu, Ahuna, Yemshe etc. The state is and ideal place for trekking, jungle camping and rock climbing. Famous sanctuary of the state are Intanki Wildlife Sanctuary and Fakim Wildlife Sanctuary. Tripura is also called as Queen of Eastern hill. Major tribes of the state are Bhutia, Bhil, Jamatia, Garo, Lepcha. Rowa Wildlife Sanctuary, Trishna Wildlife Sanctuary, Gomati Wildlife Sanctuary are some famous Sanctuaries of Tripura.